Osho, the Fourth Way, as taught by Gurdjieff, has been called the way of conscience. What place has conscience in your teaching? The question is from Cecil Lewis. No place at all. I don’t believe in conscience, I believe only in consciousness. I don’t believe in morality, I believe only in religion. I am amoral. Conscience is a trick of the society played upon you. The society creates conscience so that you may never need consciousness. You have been deceived. For example, when Jesus says ‘Love is God’ it is not out of his conscience, it is out of his consciousness. He knows it. It is not a belief, it is his experience. When a Christian says ‘Love is God’ it is his conscience, not his consciousness. He has not known it, he has not lived it. He has only heard it repeated again and again – he has become hypnotized by it. Each child is being hypnotized by the parents, the priests, the politicians, the society. Constant repetition of a certain thing becomes conscience. You go on teaching to the child, ‘this is right. This is right. This is right.’ Hearing it again and again, his mind is being conditioned. After many years he will also say ‘This is right’ – it will be automatic. It will not be from his own being, it will come from the gramophone record that the society has placed in his being. It is like an electrode of Delgado. It is the dangerous trick that the society has been playing on everybody, down the centuries. That’s why there are so many consciences in the world – the Hindu has one type of conscience, the Mohammedan has another type of conscience. How can consciences be so many? Truth is one. And consciences are so many? From my childhood I was taught a very, very, strict vegetarianism. I was born in a Jaina family, absolutely dogmatic about vegetarianism. Not even tomatoes were allowed in my house, because tomatoes look a little like red meat. Poor innocent tomatoes, they were not allowed. Nobody has ever heard of anybody eating in the night; the sunset was the last limit. For eighteen years I had not eaten anything in the night, it was a great sin. Then for the first time I went on a picnic with a few friends to the mountains. And they were all Hindus and I was the only Jaina. And they were not worried to cook in the day. Mm? The mountains were so beautiful and there was so much to explore – so they didn’t bother about cooking at all, they cooked in the night. Now it was a great problem for me to eat or not to eat? And I was feeling really hungry. The whole day moving in the mountains, it had been arduous. And I was really feeling hungry – for the first time so hungry in my life. And then they started cooking. And the aroma and the food smell. And I was just sitting there, a Jaina. Now it was too difficult for me – what to do? The idea of eating in the night was impossible – the whole conditioning of eighteen years. And to sleep in that kind of hunger was impossible. And then they all started persuading me. And they said, ‘There is nobody here to know that you have eaten, and we will not tell your family at all. Don’t be worried.’ And I was ready to be seduced, so they seduced me and I ate. But then I could not sleep – I had to vomit two or three times in the night, the whole night became nightmarish. It would have been better if I had not eaten. Conditioning for eighteen years that to eat in the night is sin. Now nobody else was vomiting, they were all fast asleep and snoring. They have all committed sin and they are all sleeping perfectly well. And they have been committing the sin for eighteen years, and I have committed it for the first time and I am being punished. This seems unjust! Conscience is created; it is a conditioning. All that you think is good or bad is nothing but a conditioning. But this conditioning can go on managing your whole life. The society has entered in you and controls you from there, from within. It has become your inner voice. And because it has become your inner voice, you cannot hear your real inner voice. So my suggestion is: Unburden yourself of conscience. Throw all the conditioning out, cathart it, be free from it. That’s what I mean when I say don’t be a Christian, a Hindu, a Jaina, a Buddhist. Just be. And be alert. In that alertness you will always know what is right and what is wrong. And the right and the wrong is not a fixed thing – something may be right in the morning and may be wrong in the evening, and something may be wrong in the evening and may be right in the night. Circumstances change. An alert man, a conscious man, has no fixed ideas. He has spontaneous responses but no fixed ideas. Because of fixed ideas you never act spontaneously. Your action is always a kind of reaction – not action really. When you act out of spontaneity, with no idea, with no prejudice, then there is real action. And action has passion in it, intensity in it. And it is original and it is first-hand. And action makes your life creative and action makes your life continuously a celebration; because each act becomes an expression of your being. Conscience is a false being. I think the French language is the only language which has only one word for consciousness and conscience – a single word, meaning both. That is beautiful. Real conscience should be only consciousness, nothing else. You should become more conscious. But about consciousness also, I have differences with George Gurdjieff. When he says ‘be conscious’ he says ‘Be conscious that you are.’ He insists for self-remembering. Now, this has to be understood. Your consciousness has two polarities. One polarity is the content. For example, a cloud of anger is inside you – that is the content. And you are aware of the cloud of anger – that is consciousness, the witness, watchfulness, the observer. So your consciousness can be divided in two – the observer and the observed. Gurdjieff says: Go on remembering the observer – self-remembering. Buddha says: Forget the observer, just watch the observed. And if you have to choose between Buddha and Gurdjieff, I will suggest choose Buddha. Because there is a danger with Gurdjieff you may become too self-conscious – rather than becoming self-aware, you may become self-conscious. You may become an egoist. And that I have felt in many Gurdjieff disciples – they have become very, very, great egoists. Not that Gurdjieff was an egoist – he was one of the rarest enlightened men of this age. But the method has a danger in it: it is very difficult to make a distinction between self-consciousness and self-remembering. It is almost impossible to make the distinction, it is so subtle. And for the ignorant masses it is almost always self-consciousness that will take possession of them; it will not be self-remembering. The very word ‘self’ is dangerous – you become more and more settled in the idea of the self. And the idea of the self isolates you from existence. Buddha says: Forget the self, because there is no self. The self is just in the grammar, in the language; it is not anything existential. You just observe the content. By observing the content, the content starts disappearing. Once the content disappears, watch your anger – and watching it, you will see it is disappearing. Once the anger has disappeared there is silence. There is no self, no observer, and nothing to be observed. There is silence. This silence is brought by vipassana, Buddha’s method of awareness. Ordinary man does both. He goes on changing his gear – sometimes he observes the self, sometimes he observes the content. He goes on moving from this to that, he is a constant wavering. Gurdjieff says the one thing is: Be settled in the observer. Buddha says: Look at the observed. My own approach is different from both. My approach is that Gurdjieff’s method is more dangerous than Buddha’s method, but even in Buddha’s method there is bound to be some tension – the effort to watch. The very effort to watch will make you tense. If you are continuously making effort to watch, then in the night you will not be able to relax and fall into sleep – the watching will become continuous. And if you are watching even in the night, how can you fall asleep? You cannot relax, the tension has become fixed. It is a known fact that Buddhist monks sleep only three, four hours at the most. It is not a gain. They think, and others also think, that this is a gain – they have attained something, they sleep only three, four hours. It is not. They are losing something very valuable – relaxation. And they will look tense; on their faces they will look tense. They will look very quiet, but tense. They will look very silent – but their silence is not the silence of relaxation, but of effort. You can see the effort in the comer, defining them. My own method is: You relax. Neither watch the watcher nor watch the watched. Just relax, be passive. If something floats and you cannot help seeing it, see it. But don’t make any effort to see it deliberately. If you are relaxed like a mirror, if some cloud passes by, it will be reflected. Be like a mirror – lucid, passive. Drop both – the Gurdjieffian method of self-remembering, and the Buddhist method of watching. But if you have to choose between Gurdjieff and Buddha, choose Buddha. If you have to choose between Buddha and me, choose me. Relax. And just see things. And there is nothing much – if you miss something, it is not of worth. You can miss, you are allowed to miss. Take life easy, take it easy. So people who have been in some kind of effort – and Gurdjieff’s work is of great effort – will be puzzled here. That’s why Lewis is puzzled, a little bit confused. And sooner or later, either he has to understand me or he has to condemn me – both are open. And condemnation will be easier. Because for thirty years working hard – and now suddenly he has become attracted to a man who does not believe in effort at all. Who does not believe in improvement, who does not believe in growth, who does not believe in going anywhere, who does not believe in any way. He says, the Fourth Way, as taught by Gurdjieff. What I am teaching here is: No Way. There is really no way, because truth is not a goal. All ways lead away from where we are. All roads, all ways, all paths, distract you from truth. And there is nowhere to go, either, and nobody to go. There is no way of being here and now but to be here and now. When I say ‘Be here and now’ don’t ask how – the ‘how’ will take you away. When I say ‘Be here and now’ don’t ask ‘What is the way to be here and now?’ There is no way of being here and now but to BE here and now. There is no way to be still, and no need of any way. To see, wholly to see, that there is no way, is at once to be still. Seeing that – is stillness. All ways lead everywhere but here. To live one’s life as it comes and goes, is awareness; passive, lucid, mirror-like, with no tension. So I don’t teach you attention, because attention has the word ‘tension’ in it. And the phenomenon of attention has the feeling of tension in it – hence the word ‘attention’. Enjoy, relax. Just understanding this, that there is nowhere to go, is liberation. Liberation is not like a goal somewhere else waiting for you. Liberation is understanding that you are already liberated. It is impious for us to assert so flatly what should be, in the face of what is. What is, is the truth. Yatha Bhutam – that which is, is the truth. To assert what should be, is impious, sacrilegious, it is a sin. ‘Should’ is a sin. That which is – relax with it, float with it. I don’t teach even swimming, I simply say float with it. It is our responsibility to know how to accept and live through that which is. So I don’t teach any way – fourth or fifth or sixth. And I don’t teach conscience, I teach a lucid relaxed consciousness. Out of that, many flowerings happen. Out of that, many songs are born. But they are born on their own. You cannot be the doer of them and you cannot feel enhanced that ‘I have done’. You cannot feel your ego fulfilled through them. The more those flowers will come, the more you will disappear. And one day there is flowering, but you are not. That is the day, the moment, of liberation. 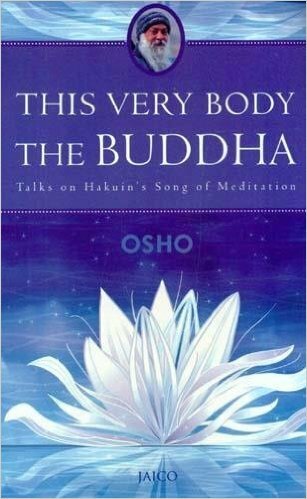 Osho raises some interesting points about Gurdjieff’s self-remembering and Buddha’s vipassana, and compares both to his own “no-way” approach. The problem I have with what he says, however, is that at a certain level some of it is self-contradictory. But truth IS a goal. His very effort to articulate his position is an effort to see and convey a truth and to help others see it too. This involves directed activity with a true statement as its goal. So truth is a goal. To convey accurate information about something is a goal-oriented project that we carry on all the time. I am carrying it on right here and right now and I am right here and right now doing this, and the one does not distract from the other. Again, I disagree. Wherever you are going, whatever way you go, there you are. The direction you are going in is part of what and where you are. Motion is ontologically fundamental. We are a system of motions. Light, sound, bodies, the universe, and even spacce itself, apparently, are all in motion. So there IS a way, after all, and despite what he said earlier about there being now way, of being here and now, and that way is to be here and now. But here is where all ways are leading, and seeing is a proccess, a motion within the neural system and within mental awareness, not a stillness. Stillness can be, in theory, either a lack of all motion (if such a thing were possible), or a lack of relative motion. In the latter sense, stillness is a second-order property of a certain kind of motion. It is a lack of change in the form or speed of the motion, a lack of an acceleration or decceleration. a second-order derivative equal to 0. But, to live one’s life uncritically and just anyhow is not reflective awareness, and life requires us to focus our attention on certain things, so there’s no getting around attention, and there is no getting around ALL tensions. But some tensions are better for human organisms than others, so, we search for a way of gettig around the worst tensions like hunger and lack of affection and lack of a good conversation. On the contrary, liberation is a goal, a potentiality in mental space, and that goal, that place in mental space, is the understanding that you are in fact, in actuality, not just potentially, in that space. And yet that awareness itself involves a comparison between actual and potential and a judgment, a measurement, of certainty. Potentiality and actuality constitute a movement and an interplay of information, so what is actual is also potential, but what is actually potential, rather than just logically or hypothetically potential, is not necesasarily actually actual. On the contrary, what is, is simply what is. What is true is a proposition that states a fact about what is. Truth is about facts and about testing facts. ‘It is snowing’ is true if and only if it is in fact snowing. Truth is the infinite set of true propositions, or facts, about what is, but also about what isn’t, or about what could be. I disagree. ‘Should’ is simply organism-talk. ‘Should’ is an essential piece of vocabulary for an organism, for a living system. It reflects “set-points” in itself and in its environment that the organism must maintain in order to survive and reproduce. “Shoulds” as subjectively self-represented are felt as tensions, as in “I should stop writing now because I need to get ready for work at Wal-Mart.” Not all “shoulds” are sins. The “shoulds” that Republicans feel as they pull the lever to vote for even more capitalistic exploitation of the lower and middle classes are, however, yes, a sin. They have brains that should know better. Stones don’t need this vocabulary. Osho offers a stone’s view of the universe. Perhaps Osho uses contradictions beneficently to help open people to new possibilities, and this may be in itself a good thing. However, this is in the end a self-limiting stategy and easily turns into a tool of manipulation and of leading people on into dependence. I don’t want to offend, Prem, but after that list of all the books that Osho read, I am surprised at what I honestly perceive to be a lack of intellectual stature in Osho. He has a facile mind that is too facile by half. At least that’s my impression at the moment. Thank you John for your extremely thoughtful response. Buddha used to say that we use a boat to cross the river, but we don’t continue to carry the boat on our head after we have crossed. We drop the boat. We use words to point us to our own nature but we don’t continue to be entangled in the words. They are pointers. When we hear that there is no goal we can argue that – that is a goal – or we can see the fact of it and STOP. FULL STOP. In addition, what could possibly be said about the WHOLE which would not be able to be contradicted? And finally, a Master is always responding to the questioner. Addressing those issues that are preventing the questioner from being in his real nature knowingly. Hence Gurdjieff would make one side of his face express one thing to one disciple and the other side of his face would be expressing something entirely different to another disciple. Oh, how inadequate is the tool, that is designed for dividing the whole in order to communicate, to be used to understand the WHOLE UNDIVIDED REALITY.